Hopi horse sterling silver overlay money clip. 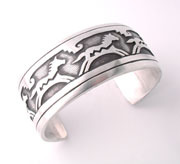 The horse symbol is hand cut from sterling silver and then overlaid onto the nickel clip. Measures: 1� x 1-1/2�.